As kids start school this year, the Sauk Prairie Food Pantry opens their new Pantry Annex at the High School. Students will be able to access the Pantry Annex in a quick and convenient manner right after school ends. This will help High School students and their families obtain needed food resources. High School is a busy time for students – along with a lot of growth. The school district provides breakfast and lunch through their free and reduced program but that still leaves many students hungry after school and on weekends. Working families may not qualify for benefits but be within a range of income that is insufficient for all expenses. The Food Pantry Annex is located in a small room off one of the High School classrooms. The room was chosen to provide students with a sense of privacy but also for ease of access. The High School currently staffs the room approximately two afternoons a week for a half-hour after school ends. 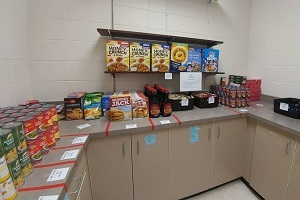 Please visit the Sauk Prairie Eagle Newspaper to read their article on our Food Pantry Annex.